We have exciting news to share with you: Due to the overwhelming success ofCERIWholesale.com's jewelry sales, CERIWholesale.com has split into two websites to better serve our customers starting June 1, 2009. CERIWholesale.com will also continue to satisfy wholesale shoes and handbags needs, while our brand new site, CERIJewelry.com, will accommodate wholesale jewelry buyers. Try this ultra glamorous cocktail ring for a night on the town! 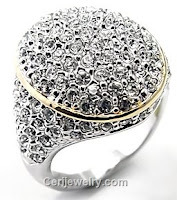 CERIJewelry.com is focusing solely on jewelry, so you can enjoy more promotions and faster delivery time. In addition, you will also have an even better selection of fashionable and glamorous necklaces, bracelets, rings, and other accessories. Check out Cerijewelry.com's blog: here. Into gladiator sandals, strappy platforms, and beautiful handbags? Continue to visitCERIWholesale.com for the best collection of wholesale shoes, at amazing and affordable prices.